This RUST electricity guide was created by our content partner Quick Electric. He provides simplified, easy to follow video tutorials around RUST’s electricity system. Each of Quick Electric’s videos walks through the necessary components and their interactions. 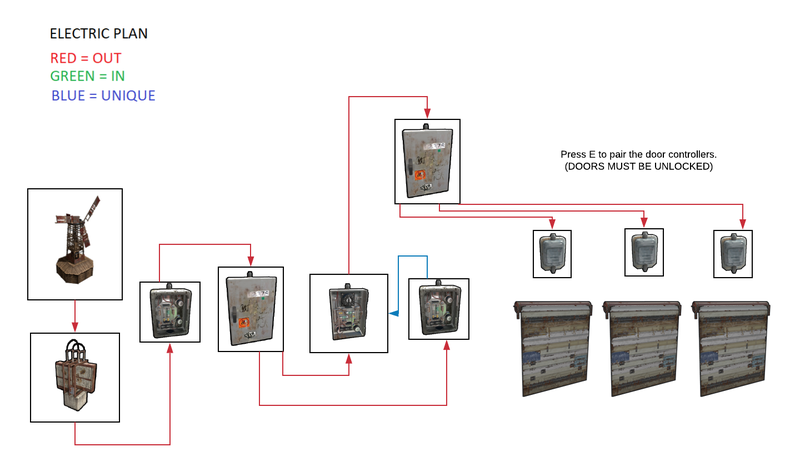 You can follow up each video with a detailed schematic that shows all of the components and how they’re integrated into the greater system. In this video, Quick Electric applies some of his previous video’s topics into an actual RUST base design to see them in action. Be sure to browse Quick Electric’s past videos and don’t forget to subscribe to his channel to receive notifications on his latest videos. Hey everybody, Rust Quick Electric here with you today to showcase a video that is outside the norm in which there won’t necessarily be much wiring, but it will be a demonstration of the practical use of many of my prior video tutorials. I come to you today with a base that showcases the use of practical electronic devices in the base, since many people seem to have a hard time distinguishing what actually might be useful in a wipe and what is not. 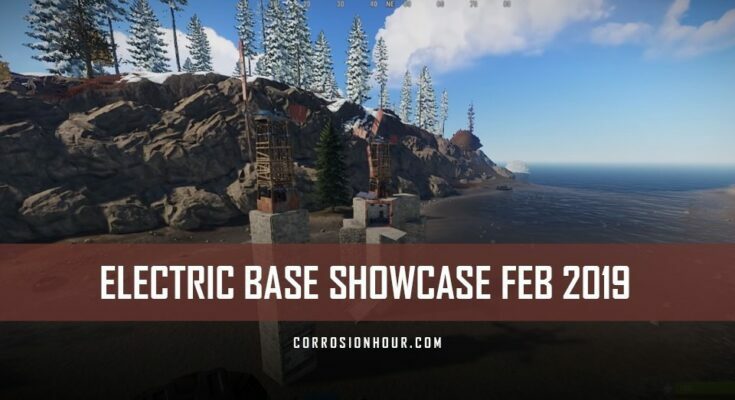 Now this base showcases, while it is not a professionally built base, it is meant more so to demonstrate the practical use of different builds in a wipe. So this build video will showcase the automatic anti-door camp turret, the minicopter garage, automatic lights for your base, as well as a small new addition, but it implements the exact same use of the minicopter garage, and that would be a boat garage. Now for many wipes, the minicopter garage has been an absolute necessity for me. The amount of distance you can travel on the map, be it that from one corner to another on a large map takes approximately one hundred to one hundred fifty low grade, that’s a just outrageous amount of travel for minimal cost. And the access of always having a boat. Now while this build is just too small for the rib, it is perfect for the rowboat and having access to any cargo ship immediately available rather than having to search the coastline is very very useful. You can do it solo with the sensors so it allows you to pilot and land the minicopter as well as the boat without assistance. So let’s get onto it. The space, while structurally sound, is not that impressive. I would suggest many other fantastic base builders such as Drizzza or plenty others that have many options. I tend to find people that have bases that actually know a little thing or two about making them before I perform any buildings. But this one is one that I’ve created for now. It implements several base designs, such as honeycomb, boat, and minicopter garages. You’ll see as we enter in through the front doors, we have a switch for the anti-door camp turrets. Now none of these have power right now because power management is a huge thing, and with a two turbine base, it’s really hard to accumulate power and have a constant flow running. So you’ll see here that we just have more furnaces in that other garage, but in the boat garage, we come up to our main power supply. Now this is assumed that you just don’t have that many people, and wind turbines are extremely expensive, so this kind of display uses two wind turbines connected through combiners that power into a large battery which is charging, as well as two solar panels with a route combiner as well as a large battery for outputting to an excessive amount of lights. This can be done with a small battery, but when you start chaining together eight or nine lights, you want the output of one hundred versus ten. Now with this main power source here, this is our on/off, and you’ll see that we have the three outputs, one being the minicopter garage, one being the boat garage, and one being the front door anti-camp turrets. Now you always want the kill switch with your main power source. You could direct line it in, but it’s going to be a constant drain through here since it will be using a splitter. You could use a branch, but for means of convenience, a splitter is perfect for this scenario because I have three specific outputs. Now you’ll see with two wind turbines the drain is minimal. It’s about one drain per two seconds. And this does not always need to be on, it will typically only be on anything that you’re going to be exiting the base, and most people do not leave the base for more than two hours or so at a time, I’m speaking from my personal experience. With a four hour battery life you will have more than enough battery life, especially since it’s only draining one every two seconds or one and a half second. So we’re going to leave this one for now as we showcase the different functionalities of this, the first being the auto-turret, the anti-door camp. So once your main power source is on in your base, you’ll see that flipping the switch takes use of the simple anti-door camp auto turret which is just the three door controllers with garages as well as a splitter, which once again could be improvised for branches. That’s simple on/off switch will activate that, make sure no one is camping your door, and then you can exit your base and leave comfortably. Next up is the minicopter auto garage. Which when a person is detected, once it’s on, so we’ll see here that we have our minicopter here, it turns on. 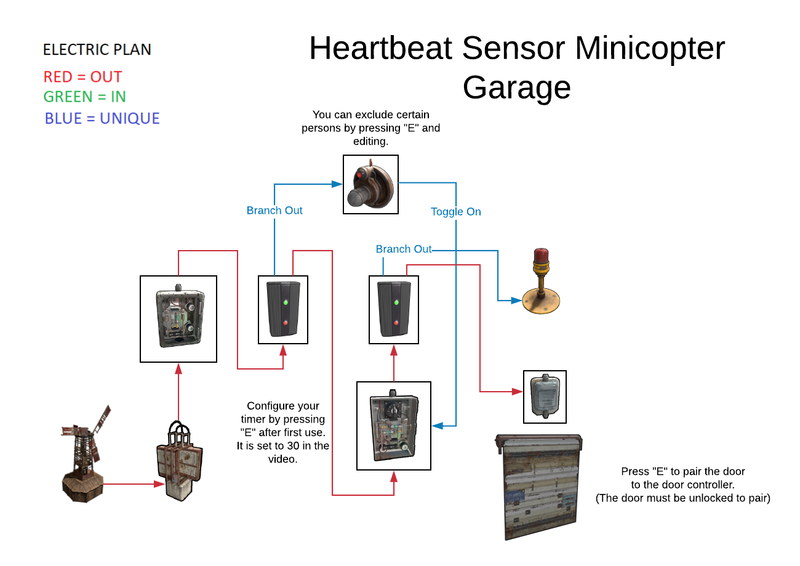 We can activate the timer for thirty second timer, at which point it will be thirty seconds that this timer runs before the garage door will automatically shut. We’re going to pretend that I’m in the minicopter right now as I now clip away, just for the sake of demonstration. Now I leave it for a thirty second timer. For many people that doesn’t seem like too much, for others it seems like way too long. It depends on your ability with the minicopter, and you’ll find the more you practice the easier it is to make a clean landing and get on inside there. It can automatically be forced shut by turning off the power supply, which makes it convenient. But as you’ll see, thirty seconds has elapsed and the garage door will shut again. This is great for cross maps, solo treks with the minicopter. As you return back in it’s going to be very hard, especially if you have a limited platform to land, and get down and open the garage door. So this opens it up as you arrive with the HBHF. You would come on in here and park and then you can manually turn it off so you don’t have to wait for this unnecessarily, and this will shut the garage doors. Next up is that auto light setup. Very basic circuit. But as you’ll see come nighttime, these lights will lose input. The power from the solar panels and all the lights will trigger. Now not many people know, but if you put your ceiling lights on the top floor of your base, the light will penetrate through the floors and actually provide light all throughout the base. Now it depends on the angle that you come through as you see through the garage it provides more light, or in the angle that you’re standing at. But it does penetrate all the way through to your base. A lot of convenience, a lot of save, it’s very nice, especially if you have a top floor that’s accessible to ceiling lights. So let’s go ahead and change it back to daytime. You’ll see that the auto lights turn off, and the battery will begin to refill again. Lastly we have our boat dock. So we go back to the first floor. Now this one for me is an absolute must with a cargo ship. It uses the exact same circuit as the minicopter. But it is specifically for a boat. So you would have your boat here, you would turn this on, you can activate the timer, which I set to a much shorter timer of fifteen seconds. You’d mount your boat, hop in, get going, come on out, and then your timer is set to fifteen seconds here. So as that timer duration elapses, that garage door shuts, and you’re good to go. Upon re-approach, it does the exact same thing as the minicopter. It opens up the garage, gives you fifteen seconds to park, hop on out, and you can turn off the circuit yourself and the garage door will shut. Now as far as opening the door, you could set up a door controller here with a little separate battery, but most of the time it’s not necessary since you can open this door easily, exit, shut the door, and then come on re-approach when you’re trying to quickly get into your base while the switch is on. Plenty of things can be expanded upon, and much more can be added to your base. But the biggest thing that you’re going to find in any vanilla or slightly modded server is the power that is required to have anything massive. Now with just these three devices, four hours on one large battery is plenty of time especially since they’ll only be for the duration of time that you’re not in your base. But for anything more extensive, and for a constant power drain, you’re going to want a bigger source of power, which many bases you’ll see tend to have between five or six wind turbines that are linked together into one major power station, at which point is broken down into substations and smaller values of power. 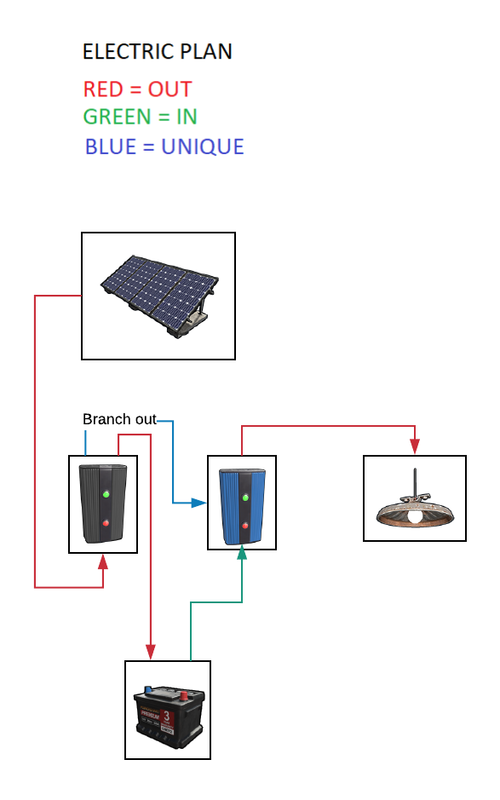 A lot of people like to use counters to do this, but for this small solo/duo/trio, it is simply handled with two wind turbines and two solar panels. It’s more than enough power to have the different devices that you need, and you can make some other funny, nifty kind of devices if you make a second large battery with more input. As far as everybody else, I’d like to thank you guys for watching and continuously contributing. The schematics for all these builds will be found in the description as with any video, and you will have seen them in the beginning. I’d like to thank everybody once again for joining the Discord, and I can’t wait to show you guys more.